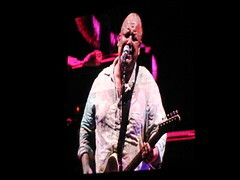 I got a bit nostalgic during the Pixies concert on Monday night. My best friend, Ami, and I listened to them almost constantly during high school. It's funny how songs can transport you back in time. 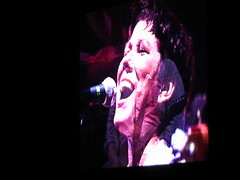 Anywho, here are a couple of pix from the show. NM has a review of the entire show. I'm off to Great Falls for some hiking this afternoon and heading to the beach this evening. Catch y'all later. My first temp assignment last week was an interesting and exhausting experience. I worked for an event management company that organized the registration table and some other logistics for the DaimlerChrysler propaganda event at the Convention Center. It was fun for the most part because there were eight or nine other temps there each day. I got to hang out with them and learn about their experiences with temping and what they did when they had permanent jobs. The women running the event management company frustrated me during all three days. They were really mean and unprofessional--not just to the temps, but to everyone. I was surprised that they could maintain a business the way they ran it. Then I learned that they only do a big event like this one once every three years or so. The practice I got in ignoring their inefficient methods was good for me. In work situations (and I guess life situations, too), I tend to tell people better ways of solving a problem or jumping in and doing it myself. For some reason, people find that annoying. If they don't find it annoying, they foist the problem into my lap and then I'm the one annoyed. At the Convention Center event, I knew that no one was interested in listening to what a temp had to say about anything, so I kept my mouth shut. That strategy made the three days quite tolerable. I wasn't there for any kind of professional or personal fulfillment. I was there for the specific purpose of earning enough money to buy a new backpack, hiking boots and sandals. When I felt myself caring about what other people at the event thought about me or my skills, I quickly reminded myself that I was there only to put in my time to buy my travel gear and that I would never see any of these people again. I really enjoyed my perspective on work for those three days. I had a lovely visit with my brother last week. We made it to Glover Park Day, the Futureheads show, iPod Jukebox and Alchemy. We also did a few touristy things. The best parts of the visit were when we chatted during walks to the store or to a restaurant. Neither of us likes to talk on the phone for long periods of time, so this was a good opportunity to get caught up on life stuff. Tonight is the Bloc Party/Pixies show at Merriweather. 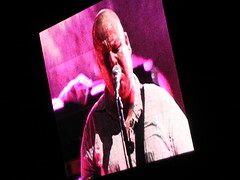 I haven't seen the Pixies since I was in high school. I expect the show to be a lot of fun. Oktbrwrld perform at Carter Barron this Friday and the Cause will be at DC9 on Saturday.
. . . go enter the bluestate contest for the Culture Club Prize Pack. However, stupid Earthlink did shut off my DSL at home a month earlier than I requested. And now that I have no desk job, I'm limited to friends' homes and the public library for my connection to the Internet. My timer here at the Cleveland Park Library tells me that I only have 38 minutes left before I log off, so this post is going to be short. I wanted to share with you all the knowledge I gained about farm animal jobs while interviewing for an internship at an organic farm outside of Baltimore. That will have to wait. Well, here's one. Know what job a goose has? Weeding. The geese won't eat certain kinds of crops, so you can put them with those crops and they'll eat everything else. Clever, huh? Don't forget to put the Washington Social Club show this Friday on your agenda. They always put on a good show. I'm also looking forward to checking out one of their openers, Exit Clov.